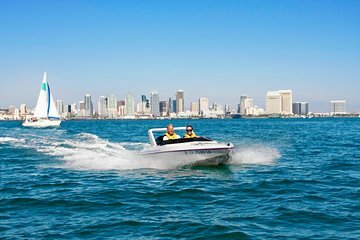 Ervaar de sensatie van het besturen van je eigen speedboot tijdens deze 2 uur durende tour door de haven van San Diego. Leer de basis van varen in uw deskundige gids voordat u de boot van uw gids door de haven volgt, langs hoogtepunten zoals de USS Midway, een onderzeeër van de US Navy, Coronado Bridge, Seaport Village, de cruiseschipterminal, het historische schip Star of India en Maritiem museum van San Diego. Leer van je gids over deze bezienswaardigheden via het ingebouwde tweewegcommunicatiesysteem en stop voor foto-opnamen van deze spannende tour. Nadat je je eigen weg hebt gemaakt naar de Cabrillo Isle Marina in de haven van San Diego, verwelkomt je gids je voor je speedbootavontuur. Begin met een veiligheidsbriefing die wordt gegeven door uw professionele gids, gevolgd door een les over handsignalen en vaarregels. Je navigeert en je eigen F13-speedboot voor de volledige tour, waarbij je de gids van je gids volgt die het tempo bepaalt in een andere boot. Uw boot is uitgerust met tweerichtingscommunicatiesystemen waarmee u uw gids tijdens de hele reis kunt horen. Als u stuurprogramma's wilt wijzigen, kunt u dit doen tijdens een van de korte stops. Ga op je 13-mijl (20 km) draai rond San Diego Harbor, die verschillende haltes voor foto ops en een kijkje op bezienswaardigheden in de haven omvat. Geniet van dichtbij vanuit uw uitkijkpunt op het water van Amerikaanse marineschepen en vliegdekschepen zoals de USS Midway, de thuisbasis van een museum dat inzicht biedt in de geschiedenis van dit beroemde schip. Rit over om het beroemde schip de Ster van India te zien, een van de vele historische schepen die zijn afgemeerd bij het San Diego Maritime Museum. Je passeert ook de Coronado Bridge, Seaport Village, de cruiseschipterminal en hebt een prachtig uitzicht op de skyline van de stad en mogelijk de zeeleeuwen die in deze wateren leven. Kies uit vier vertrektijden 's ochtends en' s middags voor uw 2-uur durende rondleiding door de haven van San Diego. The guide was experienced, helpful and fun to chat with. The office staff is really good. The tour was fun and interesting. The speakers in the boats are not as clear as they could be. The boats could go a bit faster to increase the fun. Good excursion! We visit San Diego often and this is definitely one of the most unique experiences we've had there. This was a fun experience. Driving the boats was an adventure and the harbor was fun to see. It was a little difficult to find the meeting place, that's the reason for not giving it 5 stars. Our guide Carl was amazing and was so good at his job witch my experience the best it could be. I totally recommend this excursion!!! Fun fun fun. Karl made the experience easy and relaxed. Getting to see the sights from the water is a great way to see SD. We got so close to the seals you could smell them! : Both carriers were in port, which was a treat to see up close. Our boat turned out a little slow compared to the others and Karl gave us his...right in the middle of the harbor! We would do it again for sure. The water was very rough and choppy due to weather and it being a Holiday weekend and lots of traffic on the water. Due to this the adventure had to be cut short which we were told before leaving. Was disappointed to not get to see all the sights but understood it was not their fault. The leaders boat broke down by Coronado island so we got to just mess around the area while waiting for his tow to arrive. At that point we just headed back in to dock the boats. My husband was afraid this was a follow-the-leader adventure but was very happy getting to drive and go full speed! I would do it again on a calmer day when we could see all the sights. The weather and leaders boat breaking down was nobody's fault, just didn't get quite the adventure we signed up for but maybe next time! Everything is fine, until something goes wrong. Your guide will loose its temper, shout and yell at you and at the end, he left us alone. Frustrating. Irresponsible. And for sure unprofessional and a no-go for this price. 1. If you are taller than 6', we cannot recommend this tour. We have bruises all over our knees. 2. If the two people in the boat are heavier than 400 lbs, we cannot recommend this. You will have to push your weight to the front of the boat for getting it on plane, which basically means to get speed. In the beginning you will have additional weight of the full gas tank in the front to get you going. But at the end of the tour, your weight will not be enough to push down the nose of the boat and you will never get on plane anymore. The Guide Bob or Rob will make you keep trying, but if you have any understanding of physics, it is simply not possible anymore because of your weight and the mass distribution. Usually boats have a trim to adjust the motor to this weight distribution. But these boats are simple and small and don't have it or the guide didn't tell or know about it. 3. We had rather big waves. This also interrupts the traction to the water, which doesn't allow you to get speed. We ended up trying and failing. The thing is, this trip is not a sightseeing tour. Don't expect that. You will be busy getting control over your boat and to follow the guide. He is alone in his boat and way ahead of you. They do not offer a two-way radio, there is only a speaker in the boat and while you are standing, leaning over the bow to get on plane, you will not hear a single word he says. After we mentioned this to him, he simply said I know. How helpful is that? There are not even hand signals agreed on to have a minimum of communication with the guide. When stopped the 2nd time, he told us that because of our problems in the beginning there will be no stop on the tour anymore. He more or less blamed us to ruin the tour for everybody else. Honestly, we didn't wanted to stop anymore and just go back. But guess what... Of course he stopped again, I ignored him first and got yelled at me again over the intercom... So I stopped and never got the boat on plane again. We were lying on the bow for the rest of the tour. Our knees hurt, our back and neck hurt. The guide was annoyed, rude and not helpful at all. If someone is yelling at you, that nobody ever had these problems, I can tell you to read Yelp. There a dozens of reviews stating the same problems and the same carelessness. It was frustrating and nothing, we will recommend. It might be a lot of fun, if you get speed. But there a a lot of factors, that could prevent you to get on plane. And if so, it is no fun at all. The guide is not prepared for this situation and you might end up paying a lot of money for bad service. Truly the highlight of the trip. Will do this again upon return to San Diego. The fellas there at Speed Boat Adventure are fun and professional. We even had people in the group who wouldn't stay with the rest of us because they didn't speak english, not to worry the guys didn't freak out, we just passed them up and stayed with the people who could understand what we were supposed to be doing. We were surprised how much fun this was! It was a fun and beautiful way to see San Diego! Don't plan on wearing normal clothes or makeup because you're going to get wet!